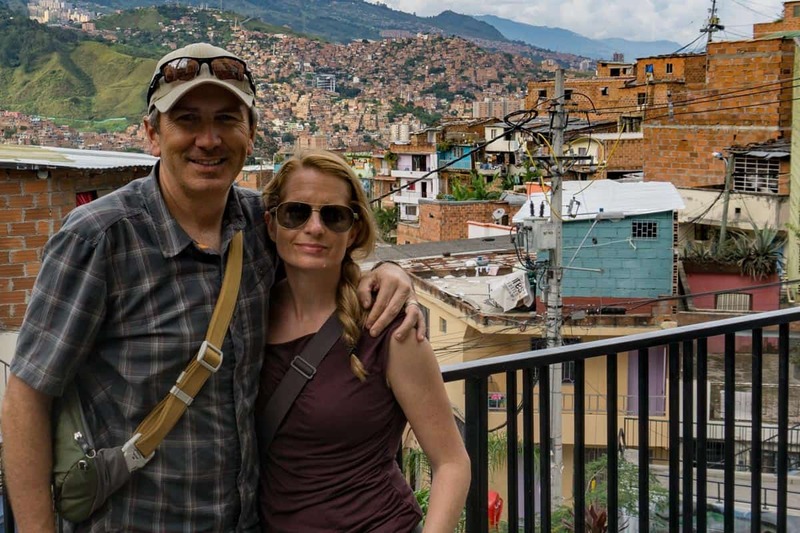 Ever since we arrived in Colombia, and especially Medellín, Troy and I have been profoundly affected by the stories of the city’s past and the heartbreaking accounts of violence and strife, especially in Comuna 13 Medellin. However, in the last few years, it has transformed into a place of optimism becoming a livable, vibrant, and growing city—and a place we have fallen in love with. It even received global recognition when it was named the most innovative city. Despite this, we see the change very much about transformation more than innovation. 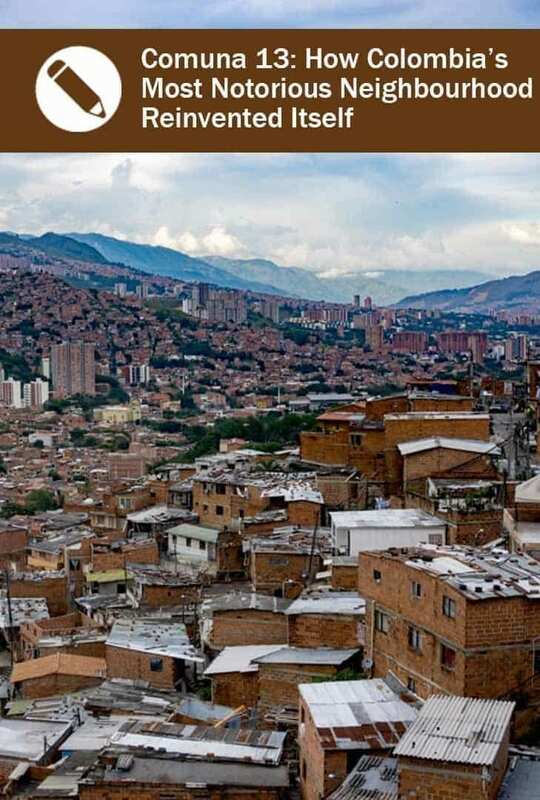 One particular area of Medellín, an area called Comuna 13, also known as the San Javier, has the most tumultuous history of the city, once labeled the most dangerous community due to its astronomical homicide rates and forced displacement of thousands of residents. Comuna 13 Medellin is an over-populated and low socio-economic zone that crawls up along the west hills of the city with thousands of brick and cement homes stacked close to one another. It was a pivotal center for paramilitary, guerrilla, and gang activity. Its location is ideal for crime, as it leads directly to the main highway (San Juan Highway), providing easy transportation of guns, drugs, and money. How could a place like Comuna 13 experience such horrors actually transform into a liveable neighborhood? 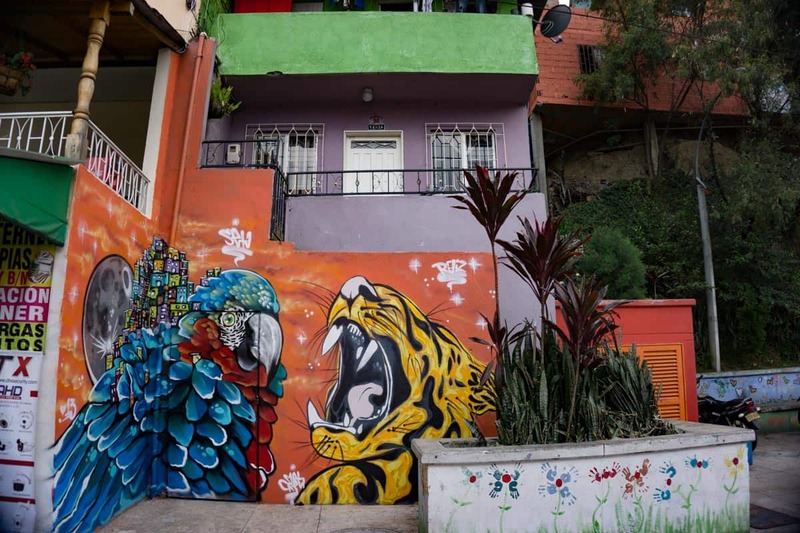 We joined a walking tour of Comuna 13 to understand what caused the immense shift. After a trip on the metro to San Javier station, we met our tour guide accompanied by a local Comuna 13 Medellin resident, a hip-hop artist who helps kids how to express themselves through music. They both shared their stories as we walked through the city streets. Book a tour - check latest prices. That's us, on the tour. 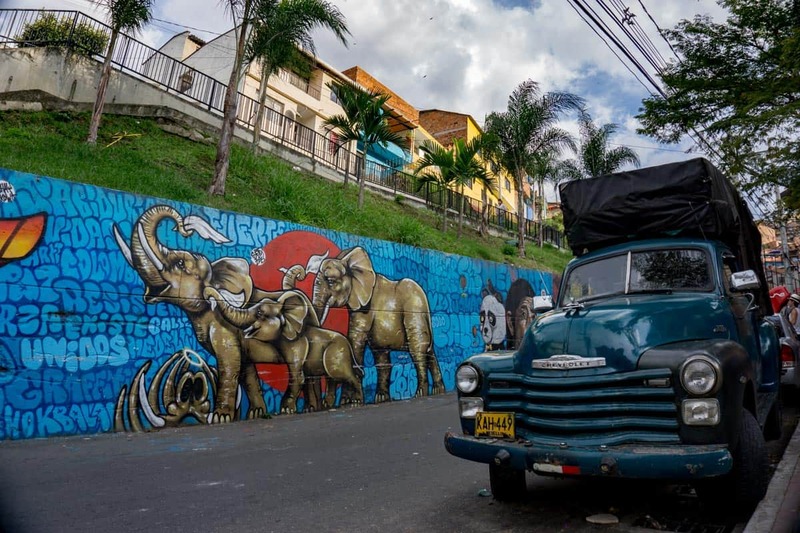 The neighborhood was controlled by groups loyal to Pablo Escobar, the notorious drug lord who lived in Medellín. Illegal activities remained rampant after his death in 1993, as drug cartels sought control of the area. Hip-hop music became a way to further express peaceful views. Dreadfully, this violence has continued and since 2009, 10 young hip-hop artists have been murdered. We listened intently to our tour guides. Residents are no longer afraid to leave their homes and their quality of life has changed positively. As we walked through the narrow roadways, kids were playing soccer in the streets, vendors were selling fruit and empanadas, and we laughed with friendly shopkeepers who let us sample their signature green mango ice cream topped with lime and salt. We felt comfortable visiting the area. However, a full transformation of this neighborhood will be slow and gradual, spanning decades. The situation is still tenuous and there’s still work to be done. 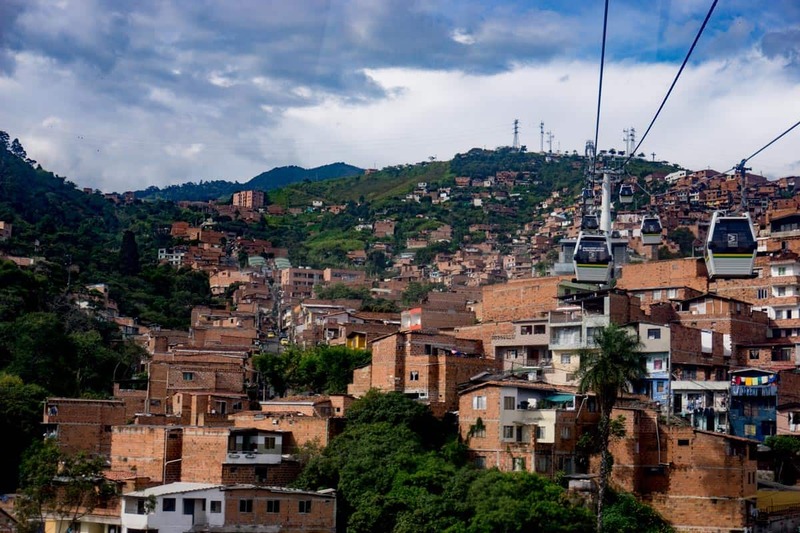 How did Medellín begin its transformation? In our view, what happened in Medellín can best be explained by the idiom: Necessity is the mother of all invention. In the case of this city, accessibility, creativity, and community were the mothers of its reinvention. Art saved the city as a vehicle for creative and political expression. The walls became a canvas to tell its history, beautifying the area and bringing optimism and peace of the residents, children, and visitors. 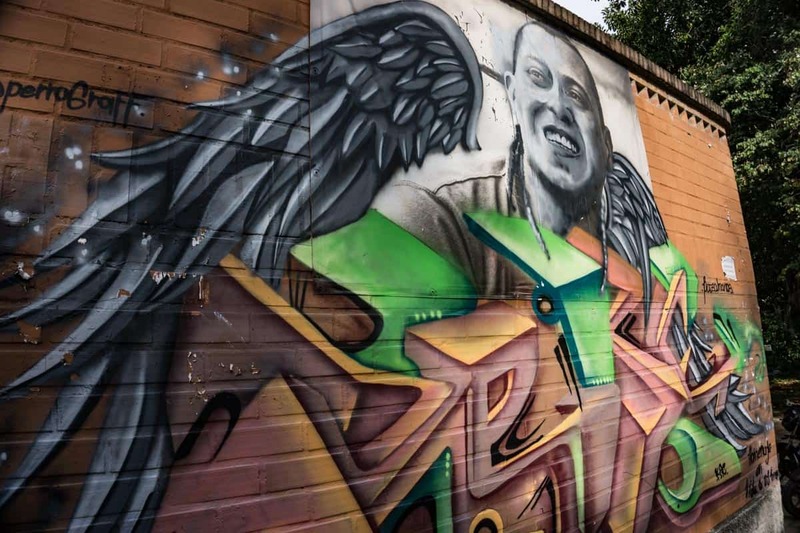 Here are selections from some of the most stunning graffiti art and photography in the area. This is a photo project below is from the NGO Project called MasHéroes (@masheroes) by Felipe Mesa. This project endorses positive role models in communities and as a tribute to those who are making a huge efforts to improve the lives of others. Thus, children can identify and look up to better role models where they live. This man, Marlon Vargas, a DJ, consistently works on social and cultural projects in Comuna 13. Unfortunately, someone defaced this photo, and then others enhanced it with graffiti to make it a more powerful image in Comuna 13. Hip-hop music continues to be an important method of expression, particularly as a way to educate and provide children with an alternative outlet instead of violence. Our resident guide in Comuna 13 Medellin shared his craft during our visit. Forward-thinking mayors have initiated numerous city projects over the years with very successful results in improving quality and way of life. One such project was the metro cable car system, which opened in 1996 as an extension of the already important metro line. 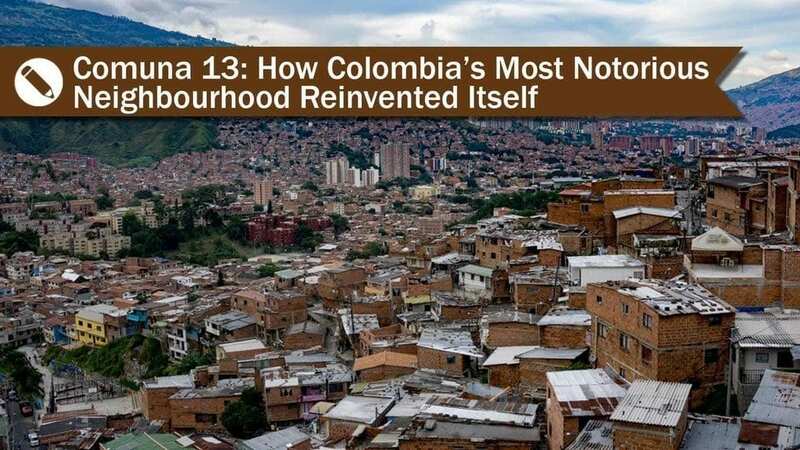 It helped Comuna 13 by providing inhabitants from all socio-economic backgrounds with easy access to the rest of the city, enhancing relationships with residents and the local government. 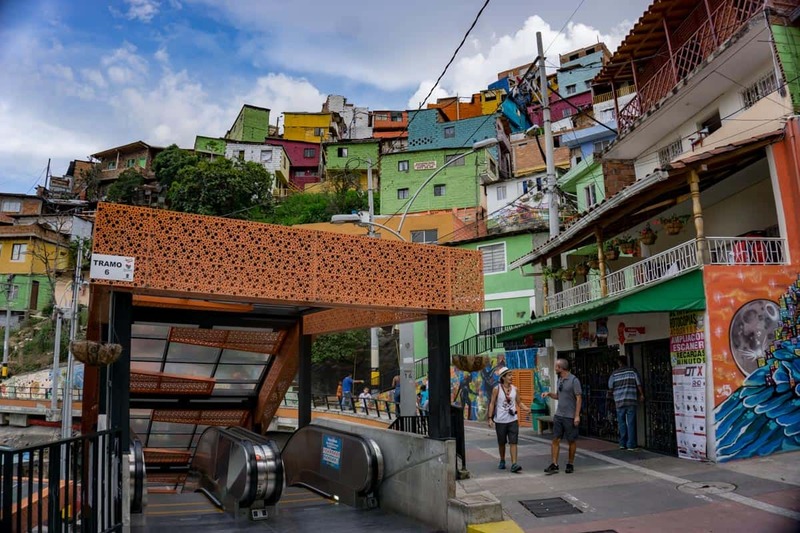 The most perplexing project (to a visitor) is the enormous 384m orange-roofed outdoor escalator, uniting Comuna 13 (located high on the hillside) to the rest of Medellín. A journey that once took residents a strenuous 35-minute hike up the hill has now been transformed into a six-minute trip. The escalator, completed in 2011, is divided into six sections allowing people living on different levels of the hillside to access at different points. 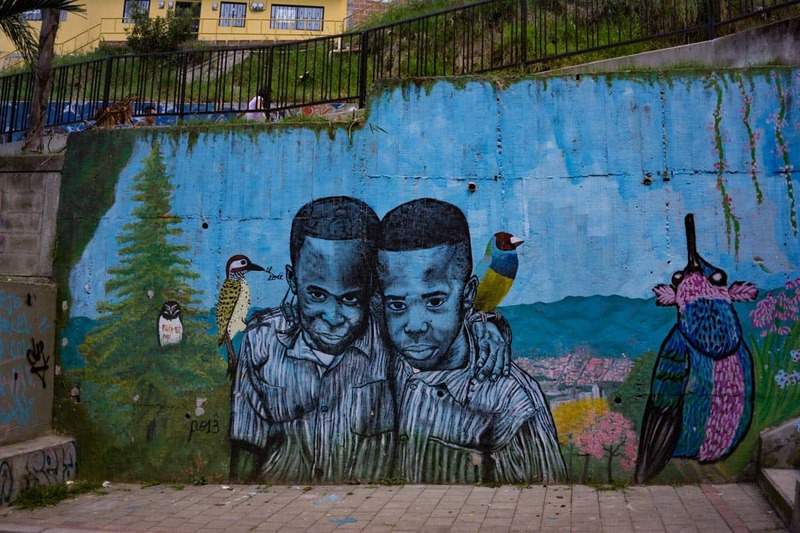 It has improved life in Comuna 13 where people now feel more connected to the rest of the city. 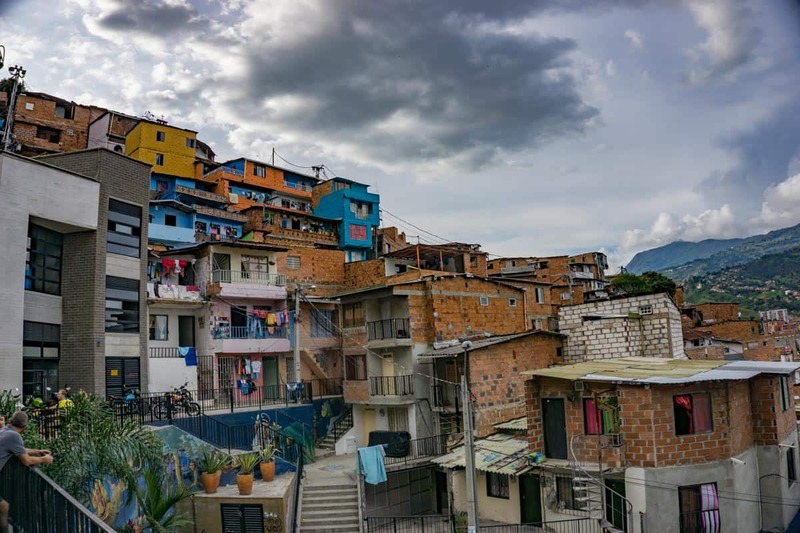 However, our guide noted that many residents question the $5 million price tag for something that only serves part of Comuna 13’s large population. With community support, the local government built important educational hubs accessible to the residents of San Javier. The Parque Biblioteca (Library Park) provides low-income children with access to computers and workshops to learn new skills. They are also able to play together in the library’s green space, equipped with recreational facilities such as soccer fields and basketball courts. Community centers and programs have been established like Cada Vida, which helps women become more financially and emotionally independent. Of all of our experiences around the world, this place gave us the most hope for meaningful change. For more tours and posts about Colombia's transformation you can find them here. For more posts and information about Colombia, you can find them here. This page includes affiliate links. By using the links on this page (at no extra cost to you) it will generate a small commission from any sales. This helps us keep providing quality content, tips for you. Thanks for your support and we hope you enjoy these recommendations!